The federal officials who came to learn about Utah’s deadly opioid crisis on Wednesday belong to a seemingly surprising agency: the U.S. Department of Agriculture. But the USDA has recently taken more responsibility in fighting the addiction epidemic gripping America, with good reason. Federal health officials say drug overdose death rates continue to rise in less-populated regions of the country, and a recent national poll found that 3 in 4 farmers and other agricultural workers have been directly affected by opioid abuse. 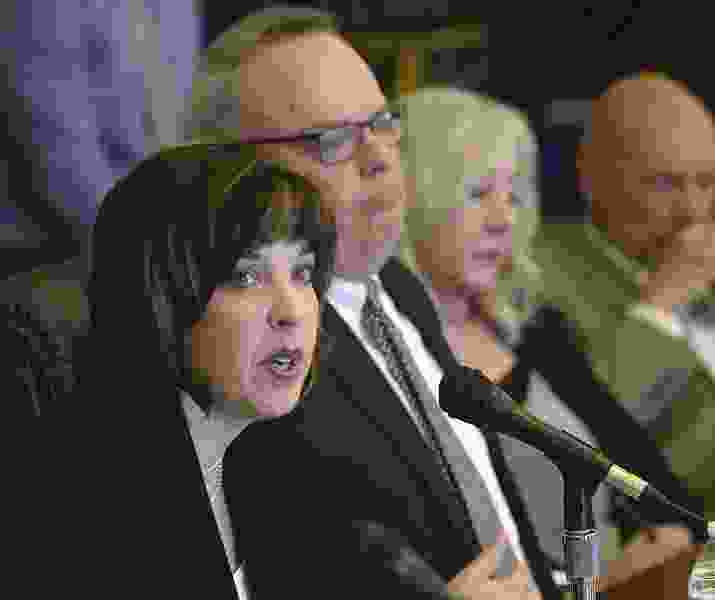 At a Wednesday meeting on Utah’s Capitol Hill, USDA Assistant Secretary for Rural Development Anne Hazlett urged state and local officials to apply for grants the federal agency is offering. These include cash for telemedicine and distance learning to be used to address opioid issues, and other funds for new community facilities, such as mobile treatment clinics. The Utah stop was one of five visits Hazlett plans to largely rural states as the USDA seeks to better understand regional needs and learn about successful opioid prevention and treatment strategies that could be replicated elsewhere. The USDA will hold similar opioid listening sessions in Kentucky, Oklahoma and Maine in the coming months. 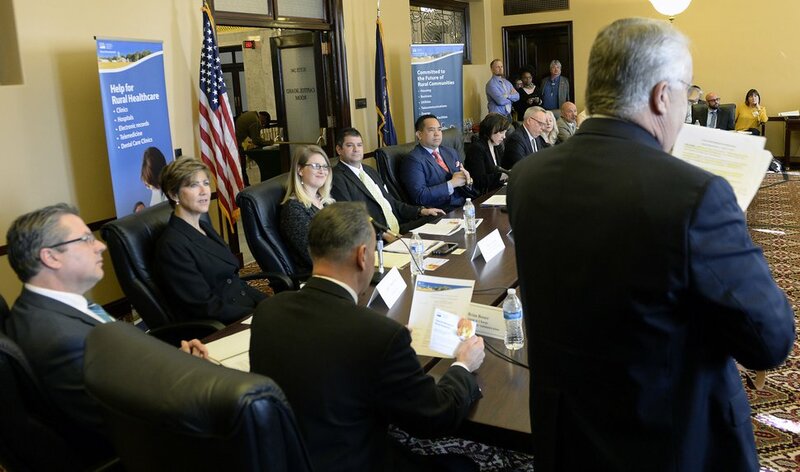 “We’re here today to learn from each of you,” she told 13 panelists on Wednesday, including Utah experts in the fields of opioid prevention, treatment and recovery. “In our community, we’re dying — and not only are we dying, but we’re killing ourselves,” Marvidikis said of the county’s opioid crisis, which she said is also contributing to the county’s suicide numbers. Marvidikis said the county desperately needs more resources to follow up with addicts. Medical first-responders, she said, face a vicious cycle of saving an addict from an overdose one Friday night — then having to make the exact same life-saving maneuvers with the opioids-overdose drug naloxone a week later. 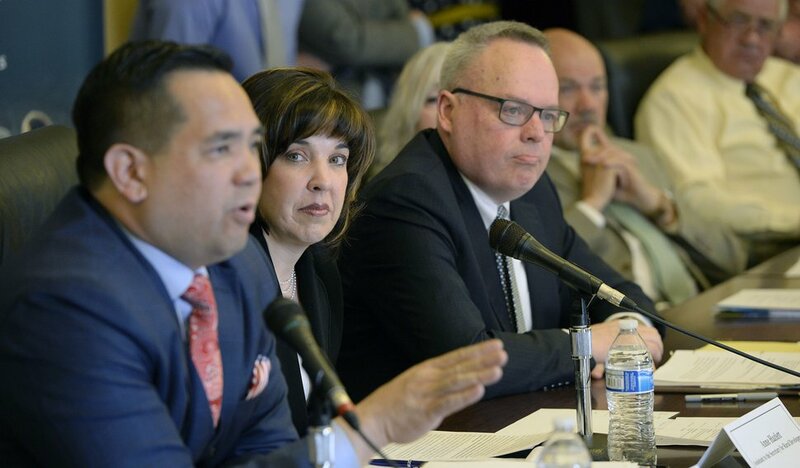 (Al Hartmann | The Salt Lake Tribune) Federal officials speak to a panel of Utah county and state leaders on opioid use in the state’s rural areas, during a roundtable at the Utah Capitol on Wednesday April 11, 2018. Carbon County, Marvidikis noted, does not have a single detoxification center. The best alternative for an area resident addicted to opioids, she said, is to be arrested and detox while sitting in a jail cell. But making necessary changes and devoting more resources to the problem is sometimes a hard sell in rural communities such as Carbon County, said Tiffany Van Sickle, a prevention coordinator for Four Corners Behavioral Health, which operates a network of treatment clinics. One program that does appear to be effective gives Carbon County jail inmates access to the drug Naltrexone, which can help them manage and recover from an opioid addiction, said Cam Williams, a medical provider at the county jail. Officials follow up with inmates after they are released, Williams said, to ensure the men and women continue to take the drug. Williams said he believes there are 60 to 70 people now sober and finding jobs because of Naltrexone treatment and subsequent follow-up. Patrick Rezac recently brought his organization One Voice Recovery to Carbon County, but he said the needle-exchange and recovery-support group has encountered several challenges, including the sheer distances and off-road driving involved in helping some county residents in their homes. But the trips are important, Rezac said, because many of those people might never interact with a treatment professional until they wound up in an emergency room. The rural opioid crisis is also affecting hiring. Lee Peacock, president of the Utah Petroleum Association, said oil and gas companies are forced to find additional workers from outside Utah, rather than have employees with opioid addictions handling flammable materials as a day job. (Al Hartmann | The Salt Lake Tribune) Sean Reyes, Utah Attorney General, left, Anne Hazlett, Assistant to the Secretary for Rural Development, left, and Jim Carroll, Acting Director, Office of National Drug Control speak to a panel of Utah county and state leaders on opioid use in the state’s rural areas, during a roundtable at the Utah Capitol on Wednesday April 11, 2018. Several officials spoke Wednesday of the need to remove some of the stigma surrounding addiction, in hopes of encouraging more of Utah’s rural residents to seek help by reducing the shame they may feel. Last year, Utah Attorney General Sean Reyes created a task force focused on opioids in conjunction with the U.S. Drug Enforcement Agency. He said Wednesday that a sense of independence that many rural Utahns have, along with strong religious influences, can sometimes deter them from reaching out for help.